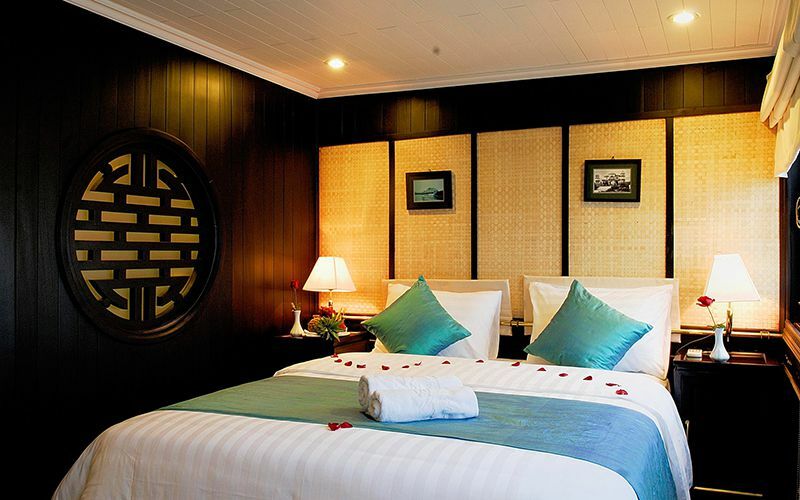 Inspired by the 14th century’s wooden junk, the 5 Annam Junks were uniquely designed and hand-built by Halong Travel, with luxurious interior and a wide selection of 5 to up to 11 cabin junk. Sailing across the exquisite sight of the tranquil Halong Bay, you can let yourself be enchanted the beauty of this UNESCO world heritage site while sipping a drink on your sundeck or admiring the breathtaking view from your cabin’s large windows. Let this floating accommodation take you to explore from the diamond in the rough – the recently discovered spots, to the most well-known and extraordinary islands and islets on the emerauld water of the bay. Our guide picks you up from 7:45 am to 8:15 am at your hotel. 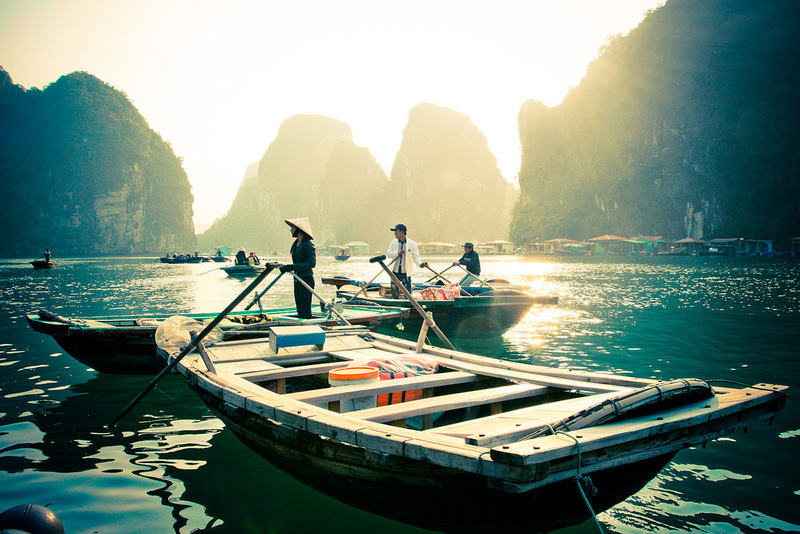 Leave Hanoi by road for Halong Bay. Enjoy the journey through the rich farmlands of the Red River Delta and the scenery of rice fields, water buffalo and everyday Vietnamese village life. Arrive in Halong and board the traditional sailing junk. Whilst cruising the exquisite waters sample the regions fresh seafood. 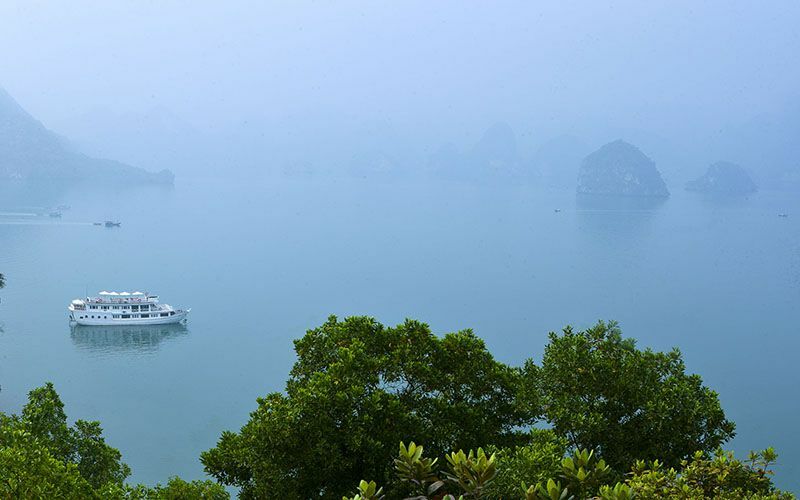 Annam Junk explores Halong bay on the most wonderful route: Dinh Huong Island, Ga Choi Island, Dog Island, and Sail Island. 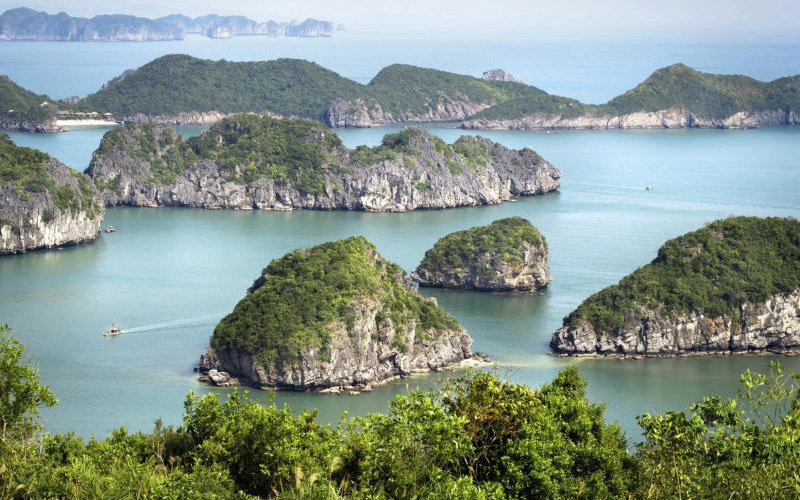 Binh Phong Mountain, Man’s head islet, Tortoise Island. Visit the recently discovered Surprise Grotto with its great views, and on the next island see the yawning mouth of Bo Nau Cave. Visit Luon cave with paddle boat. Then Junk continues to Hang Trong zone. You can enjoy cooking class on Annam junk. Arrive Trong zone; you can see the “Trong” cave and “Trinh nu” cave. Watch the sun set over the bay whilst enjoying a delicious dinner with seafood. Overnight on board junk in zone “Hang trong”, it is few cruise and tranquile zone for sleeping. Wake up to fresh coffee espresso famous in Vietnam “Trung Nguyen” and enjoy the sunrise and take the trip to Village Van Gia with small boat and kayaking to visit the Halong ecology Museum. Have lunch BBQ seafood on the boat. Afternoon, relax in the boat and enjoy Halong Bay’s landscape, kayaking in zone of floating village Van Gia and enjoy on the beach in zone of “Soi Sim”. Dinner and overnight on Annam Junk. Breakfast and continue visiting Halong Bay, visit the vegetation and smalls barren islands. 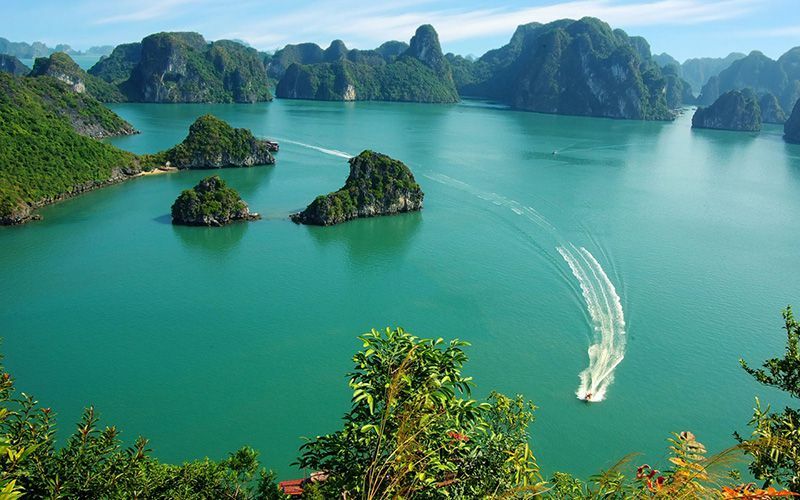 Enjoy a swim in the emerald waters of Halong Bay at any spot that you wish to visit. Go up to the Halong bay View at Titop beach. Continue visit Baitulong bay. Midday arrives to Halong city, after have the lunch on board go out of Junk. At 12:30 P.M return to Hanoi. Arrive Hanoi 16:30. Suite Class Including: Welcome drink, 5 main meals with seafood, 2 breakfasts, fresh fruit, free tea and coffee, visit ticket, insurance, 2 night accommodation on board in Suite Room. English Speaking guide.